Three years later The Press reported that “A large and enthusiastic audience greeted the Edison Projectoscope Company on their second appearance in Ridgefield at the Town Hall Monday evening. The program was opened by piano overture. Mr. Forrest gave a few short stories and parodies on popular songs. His jokes were witty and new, and were well-received by the audience. Then Mr. Plant, the manager, announced the moving pictures which were thrown on the screen, interspersed with illustrated songs, sung by Mr. Plant, who has a very pleasing voice, and stereopticon pictures of noted men. The “large and enthusiastic audience” was evidently large and enthusiastic enough to support a permanent movie theater, for in the next few years several companies came in and out of business. In 1915 The Press reported that “Mr. Ferry announces that he will start a series of excellent comedy and dramatic pictures,” which didn't speak too well of the quality of the previous pictures. About 1920 at the parish house of St. Stephen’s Church, the pillars were removed and movies were booked by Arthur Carnall, the moving spirit behind many of Ridgefield’s cinematic enterprises. The parish house movies were of the better sort, and although no admission was charged (a hat was passed after the performance for voluntary contributions), there was never a deficit. However, the trustees of the church objected to showing movies in the parish house, and the entertainment there was stopped. At about this time the American Legion Post found itself in straitened circumstance and Arthur Carnall thought of showing movies for the benefit of the Legion. The post purchased the machinery the Ferry enterprises had used and began showing photo-plays in the Town Hall on Wednesdays and Saturdays. The Wednesday shows were the better or “cultural” shows and the Saturday shows were more run of the mill, the theory behind this being that people went to the movies on Saturday night in any case. Interestingly enough, the Wednesday night movies made more money. When St. Stephen’s gave the Legion their projection machine, the booth at the town hall was enlarged so that Jack Cranston, the operator, and his two machines would fit in. Up until this time slides had been shown during intermission while the reels were rewound. All of these enterprises had musical accompaniment, furnished at one time or another by Mr. and Mrs. Willis G. Boyce, violin and piano respectively, and by Arthur Ferry, piano. 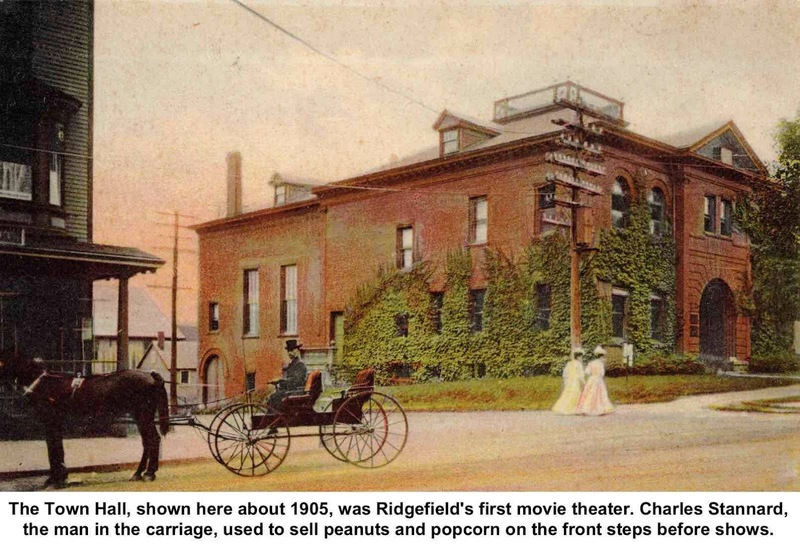 Charles Stannard further enlivened Ridgefield evenings by selling popcorn and peanuts on the steps of the town hall. During this period there was sometimes dancing after the movies, too. of South America, where talkies were unknown, so all in all, the Legion came out ahead on its movie venture. This proved to Arthur Carnall that Ridgefield would support a movie house that presented good features and did not show any “B” films. 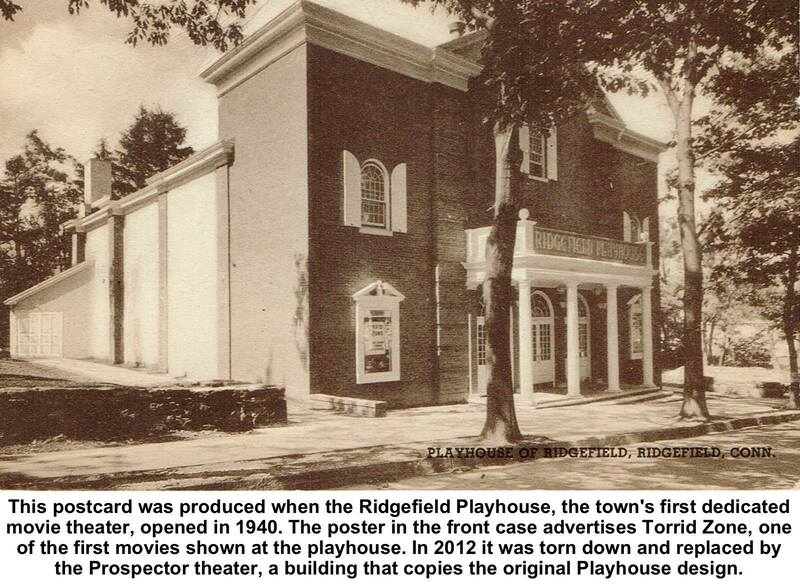 It was not until 1938, however, that Irwin Wheeler, of the New Canaan Playhouse, became interested in opening a branch of the chain owned by Casey and Wheeler in New York (later the Prudential chain) and he and Mr. Carnall picked a site at the rear of the library as a likely spot for a Ridgefield Playhouse. The library was willing to sell the property, though a provision in the deed of the library property required title action in Superior Court before it could be sold. The next problem faced by Mr. Carnall was the job of selling the public a $40,000 first mortgage bond issue. The library agreed to invest $6,000 of the receipts from the sale of the property and a public announcement was made that if $40,000 was raised, the new theater would be built. At the same time a lengthy prospectus of the plans of the theater company was drawn up and appeals were mailed to one hundred possible investors. In the next year this amount was raised, oversubscribed, and placed in escrow. Construction would have begun immediately, as plans of the theater had been completed, and printed in the Press, but the contractors estimated that the cost of the building according to the plans would make the total investment too high. The plan for the present building was prepared by John Eberson of New York, architect. John McNeill of Floral Park, Long Island, was contractor. The building was completed and ready for the first performance on March 26, 1940. Under the present manager, William Johns, the Playhouse is still sticking to the original formula of presenting good single-feature attractions and short subjects, which has proved so successful in the ten years it has been followed in Ridgefield. In addition the Playhouse has presented art exhibitions from the start and many prominent local artists have there shown their work to the community. Some Ridgefield artists who have exhibited at the Playhouse in the past few years include Herb Olsen, with his own and his students paintings; Elizabeth O'Brien, with her “table-toppers”; J. Clark Work, the portrait painter; Photographer Richard Marks; Mrs. Wognar, with her embossed pictures and boxes; Mrs. Nicholas Lefore, the landscape artist. Other exhibitors have been Mrs. Elizabeth Schleussner, with her California desert scenes; Photographer Alexander Alland of North Salem; landscape artist Bernice Webster; watercolorist Hazel Tobias, director of art at Danbury Teachers College; watercolorist Thomas De’Stasio, of the Walt Disney advertising department; Jeanne Melin, of New Canaan, whose specialty is painting horses; Ralph Jaeger, watercolorist of Armonk; photographer Janet Arem, of Croton Falls; and Mrs. Charles E. Wegmann, who has exhibited her own and her students’ work in oil painting. During World War II the Playhouse held food fairs and several bond rallies. At one rally, September 1943, $524,013 worth of bonds were sold in little over an hour. The auction by which the bonds were sold was broadcast over NBC, with Francis D. Martin serving as auctioneer. Volunteered services and articles auctioned off included a speech by Walter Hampden, nylon stockings, a pig, a calf, and cartoons by Wood Cowan and Paul Webb. Stephen Zvonkovic, the chief projection operator, is the only remaining member of the original staff of ten years ago. Except for his two years in the Army he has been with the Playhouse since its beginning. Adolpho Casagrande, custodian, has been on the staff for nine years without missing a day. Other members of the staff are Mr. and Mrs. Allen W. H. Sterry, Lois Sterry, Mrs. Marion B. Redman, H. E. Todd, John A. Hayes, David Clapp, Harold T. Scott, and Jack Yelinek.